Interstate 80 (I-80) is a part of the Interstate Highway System that runs from San Francisco, California, to Teaneck, New Jersey. The portion of the highway in the U.S. state of Utah is 196.35-mile-long (315.99 km), through the northern part of the state. From west to east, I-80 crosses the state line from Nevada in Tooele County and traverses the Bonneville Salt Flats—which are a part of the larger Great Salt Lake Desert. It continues alongside the Wendover Cut-off—the corridor of the former Victory Highway— U.S. Route 40 (US-40) and the Western Pacific Railroad Feather River Route. After passing the Oquirrh Mountains, I-80 enters the Salt Lake Valley and Salt Lake County. A short portion of the freeway is concurrent with I-15 through Downtown Salt Lake City. At the Spaghetti Bowl, I-80 turns east again into the mouth of Parley's Canyon and Summit County, travels through the mountain range and intersects the eastern end of I-84 near Echo Reservoir before turning northeast towards the Wyoming border near Evanston. I-80 was built along the corridor of the Lincoln Highway and the Mormon Trail through the Wasatch Range. The easternmost section also follows the historical routes of the First Transcontinental Railroad and US-30S. Every year, the Utah Department of Transportation (UDOT) conducts a series of surveys on its highways to measure traffic volumes. This measure is expressed in terms of average annual daily traffic (AADT), a measure of traffic volume for any average day of the year. 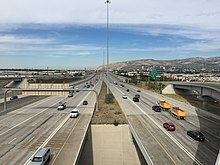 In 2012, UDOT calculated that as few as 6,765 vehicles traveled I-80 at the interchange with SR-58 in Wendover, and as many as 121,205 vehicles used the highway at the Spaghetti Bowl in downtown Salt Lake City. Between seven and 58 percent of the traffic recorded consisted of trucks. These counts are for the portion of the freeway in Utah. Bounded on each sides by military training grounds,  the I-80 corridor is overflown by commercial airliners traveling west from Salt Lake City International Airport. The freeway veers north around the Cedar Mountains in a small gap between them and the Lakeside Mountains. Further east, the highway passes the Stansbury Mountains, which are located in the Wasatch-Cache National Forest. After the mountain ranges, the freeway arrives at the southern shore of the Great Salt Lake and closely follows the shore towards the western suburbs of Salt Lake City. However, the historical routes from which the route of I-80 was derived were routed further from the lake, passing through the towns of Grantsville and Tooele; these communities are now served by SR-138 and SR-36 respectively. After an interchange with SR-36 at Stansbury Park, the highway crosses a bottleneck between the Oquirrh Mountains and the Great Salt Lake.